The 22-year-old told a follower to 'f**k off back to your own country' during a heated exchange. 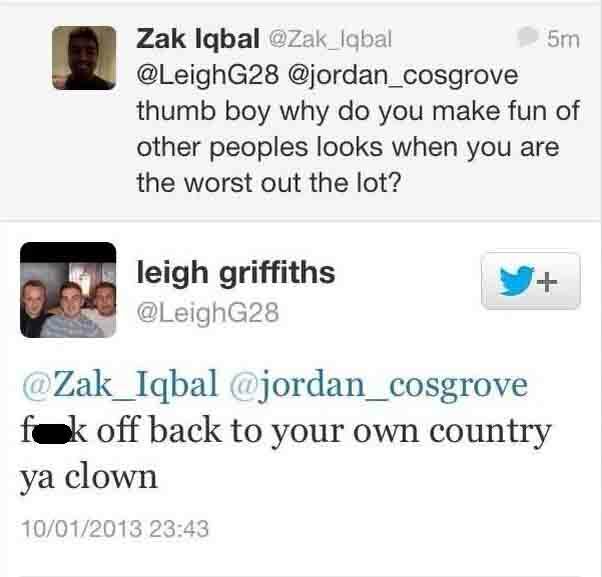 Hibs players Leigh Griffiths has become involved in a race row on social networking site Twitter. The 22-year-old, who is on loan from English team Wolves, was in a heated conversation with user @Zak_Iqbal when he said: "f**k off back to your own country, ya clown". Zak Iqbal had sent the player a message saying: "Thumb boy why do you make fun of other peoples looks when you are the worst out the lot?" Griffiths later apologised to Mr Iqbal, saying: "Got to apologise to @zaq_iqbal for my comment earlier, was out of order!" Mr Iqbal responded by saying: "I don’t really get offended about stuff like that anyway because to me at the end of the day its all banter." Griffiths' parent club Wolverhampton Wanderers said they were "extremely angry and disappointed" by the player's behaviour. In a statement they said: "Wolves are aware of an alleged racist comment made on Twitter last night by Leigh Griffiths. The Club condemns such comments in the strongest possible terms and are extremely angry and disappointed. "The player is currently on loan at Hibernian FC and is likely to remain there for the rest of the season. He is, therefore, subject to the disciplinary procedures of Hibernian FC and those of the Scottish Football Association. However, Wolves are in dialogue with Hibernian and are making their feelings known on the matter." Hibs said the language used was "totally unacceptable" and he will be disciplined. They said: "Hibernian FC today confirmed that it had spoken to player Leigh Griffiths about exchanges on a social media website. The player had realised that despite the provocation, the language he used was totally unacceptable and had already apologised for what he said. The player has closed access to the account. "The player supports the club and the whole of Scottish football in its stance against racism, bigotry and anti social behaviour. The player will be subject to a disciplinary process which will be a private matter between the club and the player." Since then, Griffiths has locked his account on the social networking site. Lothian and Borders Police said they had been "made aware" of the tweets and are "carrying out initial enquiries". Following the row, the Professional Footballers’ Association reminded players about being careful when on social networking sites. In a statement they said: “PFA Scotland cannot comment whilst individual disciplinary matters are ongoing. Despite the fact that players are often subjected to unacceptable levels of personal abuse on social media sites they should not retaliate to such abuse. PFA Scotland therefore strongly condemns racism and all discriminatory behaviour in whatever form that takes. The player moved to Wolves in January 2011 and has been on loan to Hibs since August the same year. Tweet: The exchange between the two men.